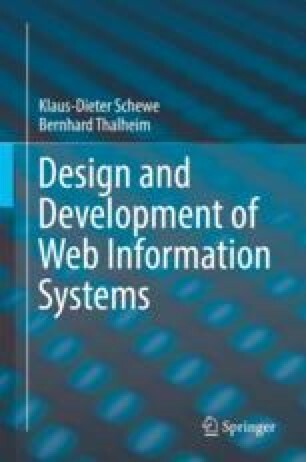 The chapter is dedicated to the important storyboarding method for WIS associated with the business layer in the abstraction layer model introduced in Chapter 1. The chapter first introduces story spaces and formally defines their syntax and semantics. This leads to scenario modelling, which captures abstractly how users navigate through the WIS, hierarchical modelling of scenes, plots (also called action schemes) emphasising the possible sequencing of actions by the users, and a story algebra emphasising the formal composition of the plots. Story space modelling is extended by adding various details such as pre- and postconditions for actions, conditions for entering or leaving a scene, etc., and alternative representations for for these aspects are presented. Second, the story space is complemented by a thorough discussion of actors, their information portfolios, roles, rights and obligations and user profiling. Finally, tasks in a WIS are investigated.